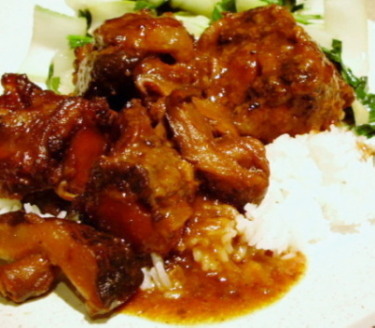 The lowly oxtail has been eaten for centuries by cultures all around the world. Most recently, oxtails have been given a more upscale profile by reknowned chefs. Perfect for braising, this collagen-packed cut of cow brings an amazingly moist morsel of meat to your table, and the resulting stock or sauce is incredibly rich and flavorful. 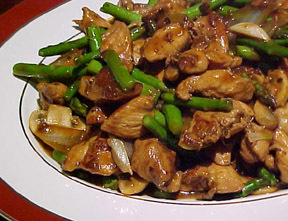 Earthly, aromatic shiitake mushrooms and zesty ginger add warm, spicy notes to this dish. Season oxtails liberally with salt, pepper and garlic powder. Place flour in a wide, shallow dish. 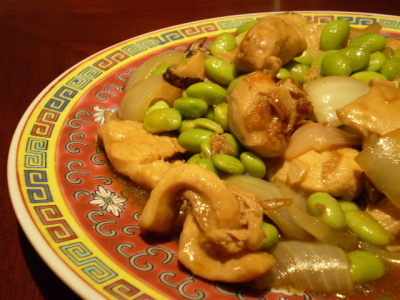 Combine onion, garlic and ginger in a small dish; set aside. Rinse mushrooms and soak in warm water for about 30 minutes, or until rehydrated. 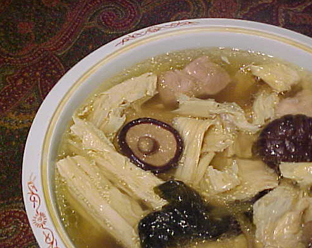 Squeeze out excess liquid and slice mushrooms into 1/2″ pieces. Add mushrooms to the onion mixture. Reserve 3/4 of the soaking liquid by gently spooning it into a cup, leaving behind any sediment. Discard remaining soaking liquid. Combine catsup, sauces, vinegar and brown sugar in a bowl. Heat olive oil over medium-high heat in a large Dutch oven. Dredge oxtails in flour, shaking off excess. Set floured dish aside. Brown oxtails, turning to ensure even browning, about 10 minutes. 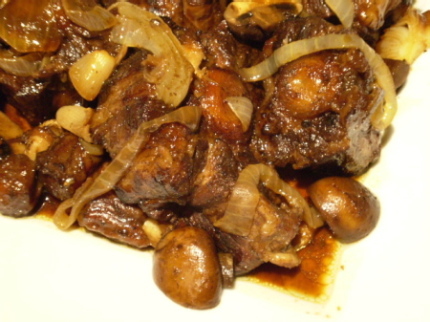 Push oxtails to one side and add mushrooms, onion, garlic and ginger and saute for one minute, stirring often. Carefully transfer oxtails and sauce to a slow cooker, placing them in a single layer, if possible. Cook on low for 6 to 7 hours, turning oxtail pieces once during cooking. 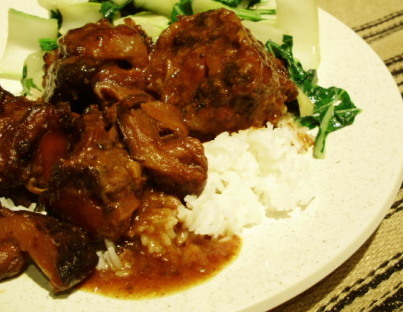 Remove oxtails from cooker and defat sauce. Serve oxtails and sauce with lots of rice and a fresh, steamed vegetable.